Lakshmi is a thirteen-year-old girl who lives with her family in a small hut on a mountain in Nepal. Though she is desperately poor, her life is full of simple pleasures, like playing hopscotch with her best friend from school and having her mother brush her hair by the light of an oil lamp. But when the harsh Himalayan monsoons wash away all that remains of the family's crops, Lakshmi's stepfather says she must leave home and take a job to support her family. He introduces her to a glamorous stranger who tells her she will find her a job as a maid in the city. Glad to be able to help, Lakshmi journeys to India and arrives at "Happiness House" full of hope. But she soon learns the unthinkable truth: she has been sold into prostitution. An old woman named Mumtaz rules the brothel with cruelty and cunning. She tells Lakshmi that she is trapped there until she can pay off her family's debt - then cheats Lakshmi of her meager earnings so that she can never leave. Lakshmi's life becomes a nightmare from which she cannot escape. Still, she lives by her mother's words - simply to endure is to triumph - and gradually, she forms friendships with the other girls that enable her to survive in this terrifying new world. Then the day comes when she must make a decision - will she risk everything for a chance to reclaim her life? 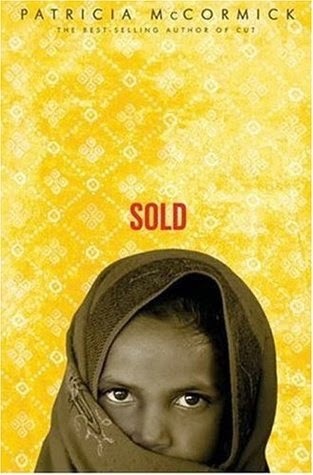 Sold is one of those books that I have had on my shelf for so long that I did not remember what it was about. When it went on sale on audiobook format through Audible I swiped it up. All that I remember about the book was that it took place in India and that the synopsis was interesting enough for me to want to read it despite the fact that it was a young adult book (not that I dislike YA fiction but it is not normally my genre). I write all that to illustrate the point that I wasn't quite prepared for Sold. As I was walking the halls of my job entertained by the story and the narrator (who was excellent by the way, more on that later) I wasn't expecting the turn. When McCormick got to the part where Lakshmi is about to be sold into prostitution, I naively hoped that what was about to happen wasn't going to happen. That her step-father wasn't really selling her into prostitution and that the "aunt" was really going to take her to be a maid in some families home. I stopped the audio and re-read the synopsis only to find out that my prediction was right. I wanted to stop listening right there but I didn't and I am happy that I stuck with it. The story is overall not a happy one, but there is hope in the pages (especially towards the end) and the fact that the story was done in first person through the eyes of Lakshmi, really made it shine. The main character and narrator of the story is Lakshmi. I honestly have nothing bad to say about her, maybe it was because I was sad that a young innocent child was sold into prostitution. Or the fact that McCormick always made sure that reader (or listener in my case) never forgot that she was a child. One of the things that I was worried about was the fact that Lakshmi might give up hope of escape and become complacent in her situation as some of the women and girls in Happiness House were. I didn't have to worry about that even when she was afraid and feeling her worse Lakshmi always held on to the hope of escaping her situation. There were several other women and girls in the story. I liked that McCormick gave them each a unique back-story and that the reader/listener got to know more about them. None of the characters seem flat to me, all of them were well round. Justine Eyre was a great narrator and I had my fears about the narration when I started listening. Fears rooted in the fact that I started listening to one book set in Saudi Arabia (I think) and the narrators accent was generic American broadcaster standard. It through me off, so much so that I had double check the location of the book and the characters to make sure my expectations were unfounded. Maybe I am one of a few people that would rather hear a story narrated by a actor with an accent similar to the ones that I imagine the characters would have. I can't say if Justine Eyre's accent was right for someone from Nepal since I am not familiar with it but her attempt pulled me more into the story. She sounded like a 13 year old girl and made Lakshmi's story come alive in my mind. She did an excellent job at switching up the voice when she had to sound like other characters. All in all Eyre is very talented. While I liked Sold and the audiobook version. I think it is a story better read then listened too. The subject matter is just too deep and at times I wish I could stop the audio and take it back up later like a book. It's harder to do that with audiobooks because it's harder to judge natural breaks in the story. I will say that the audiobook worked nicely with the vignette style of the book. Highly recommended. I think I might re-visit this one (in a couple of years) in the print format and see if my impression of the book changes any with time and format.